With all the excitement of Kate Middleton’s new baby, I wanted to talk about some “royal” baby items for all of you who are expecting. Fisher-Price recently launched its Bath & Body line, perfect for every new mom, even the royal ones. Made with gentle an natural ingredients, the line addresses the unique needs of newborn, infant and toddler skin. From basic gear and fun toys, to their new Bath & Body line or Nursery Furniture; Fisher-Price offers all the essentials for baby’s first year. As babies grow and change, so does their skin. That’s why they’ve developed a bath & body line that addresses the unique needs of newborn, infant and toddler skin. Made with gentle, natural, and organic ingredients. Contains no icky stuff, only what babies need. Friendly characters on the bottles share bathing tips that are specific to each growth stage. Brought to you from a name you trust. Available spring 2013. Fisher-Price also has a wide line of baby products that are great baby shower gifts, including the My Little SnugaMonkey Cradle ’n Swing, My Little SnugaMonkey Deluxe Bouncer and the SwaddleCinch – must haves for any new mom, as well as books by Baby Publishing to help build baby’s library. Here’s a little more detail on my (and Caleb’s) personal favorite! 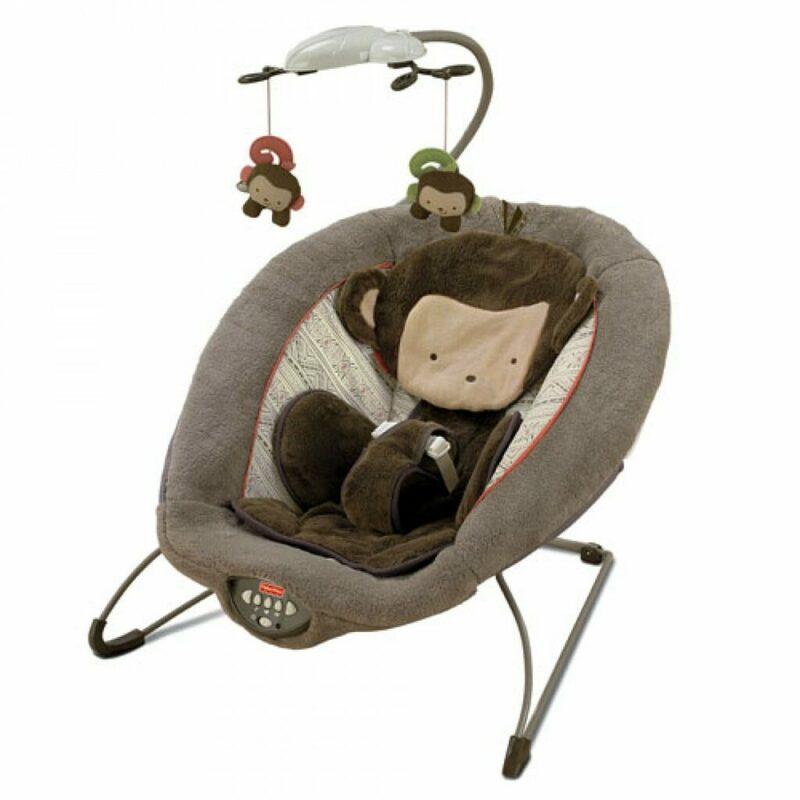 My Little SnugaMonkey Deluxe Bouncer (Sold exclusively at Target and Fisher-Pricestore.com). Snuggly, soft & comfy for your little monkey! Deluxe fabrics contour to baby for cuddly support of the head (head snuggler), neck and sides (newborn body support insert). Up to 20 minutes of songs and nature sounds, plus calming vibrations provide all the options for comfort your baby needs. A new easy-touch control panel provides mom with quick access to selection and volume control. Sweet little monkies overhead engage and delight! Requires 3 C batteries, not included. I trust the brand for my kids. I love their kids friendly products. Their products certainly last. I’m in my mid-30s and my kids still play with Fisher-Price stuff that I had as a kid at my mom’s house, stuff she saved. I love the cute colors, especially the chocolate brown. They are gender neutral and so sweet. I like that they are safe products and high quality! I love how cute and reliable they are! I love how fun they are for kids. I love that they are easy to clean, they are found everywhere and they are safe. I remember that I loved to play with them when I was young and my daughter will be the same, I’m sure. I like all the cute designs on the products. I love all of the bright colors that Fisher Price uses! I like that they are quality products at reasonable prices. I love the fact that they are durable and easy to clean! I love that it’s a brand I can trust that has been around since before I was born. They have so many products that cater to all ages. And their products are safe, functional, and practical. Thanks for the chance! I love Fisher Price products because they last and are always cute. I love that I can trust the brand because I grew up with them! I like the quality of the products. I love them because I know it’ s brand I can trust. I love the quality. I still have Fisher Price toys that I had as a child. My kids have all played with them and they are still in good shape. I like they have no Parabens or Dyes. I love the adorable design of fisher price products. I also really love the fabrics. I love the colors and the durability of their products. I grew up with Fisher Price and know from experience just how amazing the brand is! Their quality is unmatched and their products in general are just wonderful! I love that they are very kid friendly in safety. They are good quality. I love that its a brand known for their great quality of products! You can rely on them. I like it that they’re classic and never go out of style, so I can hand them down to others. I like that they are well known and well loved. They have been around for a while and their products do what they say they do. I like Fisher Price because its an old reliable name. I love the bright colors they always use. I love that they’re so safe! I love how cute and colorful they are. My 4 month old has many Fisher-Price things. I love that Fisher Price toys are so durable and they have such a wide variety of toys for different age groups. It has been a favorite in our home forever. I love the durability of their products. I love that they are affordable and safe. They are good quality products! how reliable their products they are! I trust the brand, and they have so many great products. Its a trusted brand name and I feel like they put safety and comfort first. I love that they are innovative and well made! Their quality is virtually almost always excellent. I had Fisher Price toys as a child and now my kids have them- they’re a brand I trust! I love that they are fun and educational at the same time. i like that fisher price products are quality and will last for a long time! I love the quality of their products and the durability. I love that they make quality and durable items and that they are a household name. I love their quality! I have toys from my childhood from Fisher Price that I’ve been able to pass on to my kids!